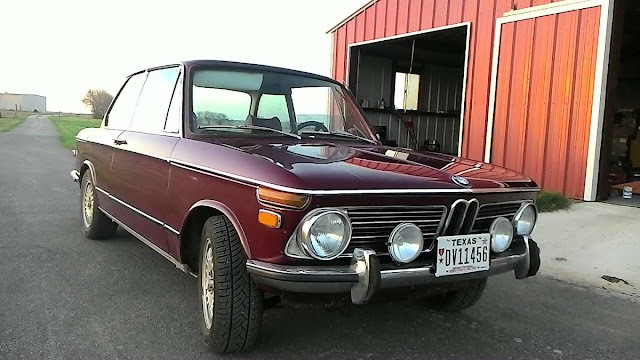 The BMW 2002 isn't the fastest car to drive from the 2nd golden era of motoring (the first was the roaring twenties, then the 1960s-1973, and well...now...but I digress) but it offers a good combination of driveability and classicality...but of which aren't strictly speaking "words"...but the BMW 2002 isn't really an automobile, either. It's a statement. Find this 1972 BMW 2002 offered for $7,500 near San Antonio, TX. Tip from FuelTruck. Have lots of extra parts--transmission, front "A" frames, steering box, extra back lenses, etc. This car was partially restored by my brother, and he did the following items to it: - The original engine was swapped with one from a 1984 3-series-- Original engine was a M05 has a bore of 89 mm and a stroke of 80 mm. It produces 75 kW (101 hp), 8.5:1 compression, Solex 40 PDSI carburetor-- Replaced with a 1.8 liter M-10 engine with a Webber carburetor, electronic ignition. Bore is 89 mm (3.5 in), stroke is 71 mm (2.8 in).-- The 1972 M05 and the 1984 M10 are both considered "M10" engines, they are visually identical (except the 1.8l stamp), the 1984 has updated bearings, ignition, carburetor, oiling, etc. Speaking of cheap BMWs guess who just bought a $500 e34? 525i manual from the original owner 100k miles. Everything works and it runs great. It even has a bunch of fancy college stickers on the back window. A friend called me last night and said his older client was selling it. If I can find a way of hosting pictures I will put some up. The steering is pretty vague and it is pretty slow. I guess a s52/m52 is a direct bolt in. Might be something for the future. Awesome. What color? Model year? I'm partial to the earlier cars in white or blue. S52 would be cool and could be made to be very reliable and worry-free, compared to an S38 anyway. I still have the black "DTM5" E34 project car, just finishing up with repainting the bumpers, side skirts, and hood. Going to put it up for sale soon. Will post something here on DT as I'm getting closer. What a great find. Nice score. Wow, very cool man! Score of the decade right there. It is going to be really hard not to modify it. I would love to lower it and do style 5s or mpars. I think this will be a really good exercise in being moderate. I am going to try and keep it stock and keep it on a tight budget. It is a 1993 red (hellrot) 525i - I don't really care for red cars but couldn't pass it up. I still can't believe it was $500. I have bought one bicycle wheel that has cost more. I think it will be a fun project to do with my boys. First thing I want to do is get some style 5s on it or mpars. I will keep my eye out for the DTM5 - Would love to be able to buy it. Nice! The red ones are cool too IMO. At least it has some color. And if it's single stage red then even better, but I'm not sure if that's the case for BMWs of the early 90s (but I know Volvo still had single stage reds then). It would be awesome if the DTM5 could go to a reader. I may cave in and submit it to BaT Auctions, but would prefer a friendly DT deal if possible! Wait....you'd seriously put it on BaT auctions? This is like crossing the streams on Ghostbusters. On the other hand, I suppose I get it.....the place is crawling with bidders with more money than knowledge of market values. At this point BaT is not competition to us, nor are we to them. Sure, both sites feature interesting old cars for sale. But they have aggressively monetized their business model and we haven't. We're like your old buddy from high school who still sits around on his parent's porch and talks about cool cars he sees driving by, and shares funny stories. He won't be getting rich anytime soon but he's fun to hang out with and shoot the breeze. Oh I get that....it's just sort of like if, in the epic movie Roadhouse, Patrick Swayze's character Dalton had gotten off work at the Double Deuce and gone to have drinks at a Fat Tuesdays. Gotcha. It's tempting. I mean, I have this interesting old performance car that has appreciated over the past few years, and there are plenty of auctions that have gone well over there, so maybe that's where the buyers are going. I would completely prefer listing it here on DT and/or selling to one of the regulars. If that works out then I'll be happy, and maybe get to hear back about how the car does with its new owner. 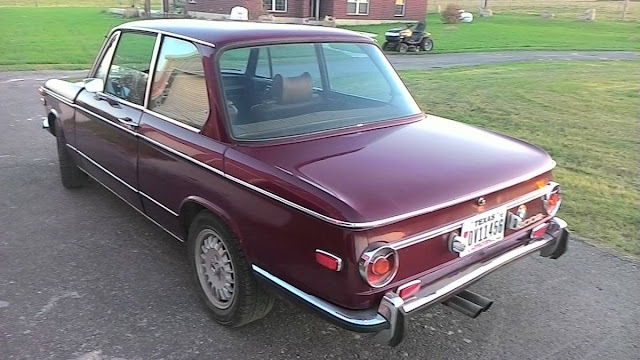 This isn't one of those time capsule, low-mile, perfect BMWs though so I'm not expecting it would bring huge bucks at auction. But it has a lot of good things going for it if someone's looking for a car to drive rather than put up on a pedestal.